Healthy foods and new protein sources are on the rise in Nordic food trends. Although healthiness and sustainable choices are seen as important, glamour and indulgence play a part as well. According to the results of Fazer’s recent Future of Food 2019 report, 41% of the Finnish respondents, reported they would be interested in favouring plant-based proteins, such as seitan, pulled oats and soya meal to protect the environment (23% in Denmark and Norway, 31% in Sweden). Furthermore, no less than 28% of the Finns surveyed would be interested in removing meat from their diet or only eating meat as an exception to protect the environment (18% in Denmark and Norway, 23% in Sweden). Individual health needs stand out in Finland, as more than half (54%) would like to eat food with nutrient profiles customised for their own needs. 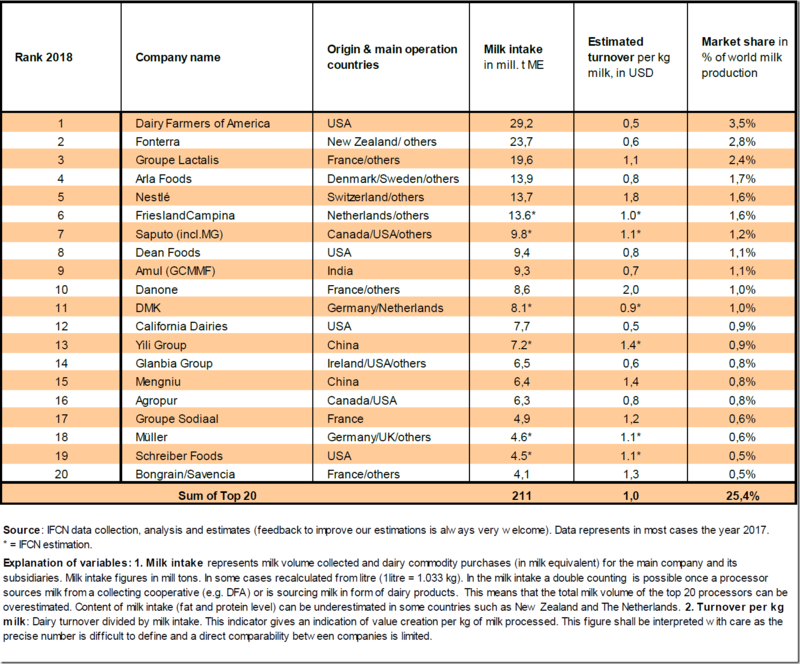 Top 3 Leaders DFA, Fonterra, Lactalis of the list stay stable their positions compared to the previous ranking in 2016. The companies Arla, Nestlé and Friesland Campina take ranks 4 to 6 with milk intake of ca. 14 mill t milk intake. French authorities have given dairy giant Lactalis permission to resume selling baby milk from a factory that was closed after salmonella-contaminated milk produced there infected dozens of babies, the government said on Tuesday, according to Reuters. Privately owned Lactalis, which has said the crisis could cost it hundreds of million of euros, had said that the production line linked to the contamination would be closed permanently but it was awaiting permission from French authorities to restart output at its other production line, Reuters says. As the consumer demand for healthy, natural products increases, Arla Foods has created a new innovation in fruit yogurts which has just hit the shelves in the German market. Driven by the dairy co-operative’s desire to create products with no added or unnecessary ingredients, Arla Bio Nur® is the first product of its kind for the company anywhere in the world and consists of only organic yogurt (75 per cent) and organic fruit (25 per cent). The name Bio Nur®, which translates as ‘just’, reflects Arla’s ambition to develop a yogurt with simple ingredients. With an increasing number of consumers recognising that the average fruit yogurt in Germany contains around 14g of added sugar, this is leading to a decline in the category. Arla Bio Nur® has no added sugar and contains between 6.8g and 7.7g of sugar, depending on the fruit variant, and consists of only natural ingredients. Arla Bio Nur® is available across Germany now and comes in strawberry, tropical fruits and red fruit variants. Produced in Uphal, Germany, it will launch into other European market across 2019. Arla har investerat cirka 16 miljoner i det nya mognadslagret i Kvibille och även gjort flera andra förbättringar i mejeriet. Bland annat byggdes ett nytt golv i ysteriet för att hålla för mer ost, ett nytt ventilationssystem för bättre luftcirkulation och så köptes nya ostformar och osthyllor in för att kunna öka tillverkningen vid högsäsong. “Vi började bygga mognadslagret för ädelost under 2017 och det har varit både en spännande och utmanande process att bygga ut en så gammal och anrik byggnad. Och nu är det äntligen dags för invigning”, säger Kvibilles mejerichef Thelma Banzon. I och med invigningen av det nya Ädelostlagret i Kvibille kan Kvibille mejeri bredda sitt utbud av ostar. 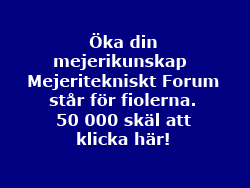 Först ut är två innovativa Ädelostar – Hallands Hav och Kvibille Mild Ädel. Hallands Hav är en långlagrad blåmögelost, som under det sista skedet av mognadsprocessen lagras vid en lägre temperatur. 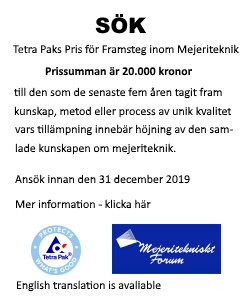 Tack vare den unika processen bryter enzymer från blåmöglet ner proteinet (kaseinet), vilket resulterar i en rund smak och krämig konsistens. Kvibille Mild Ädel är en mild ädelost. Den är i princip helt vit, eftersom den innehåller Penicillium roqueforti vitmögel, och passar väldigt bra i matlagning. Tack vare sin vita färg är den perfekt i såser, då den inte färgar såsen grå. Researchers Mahshid Dehghan, PhD, Andrew Mente, PhD, Sumathy Rangarajan, MSc, Patrick Sheridan, MSc, Prof Viswanathan Mohan, MD, Romaina Iqbal, PhD et al publish an article in The Lancet of a Prospective Urban Rural Epidemiology (PURE) study is a large multinational cohort study of individuals aged 35–70 years enrolled from 21 countries in five continents. Dietary guidelines recommend minimising consumption of whole-fat dairy products, as they are a source of saturated fats and presumed to adversely affect blood lipids and increase cardiovascular disease and mortality. Evidence for this contention is sparse and few data for the effects of dairy consumption on health are available from low-income and middle-income countries. Therefore, the researchers aimed to assess the associations between total dairy and specific types of dairy products with mortality and major cardiovascular disease. Valio och Arla har förlikats efter en utdragen tvist i Finland. Tvisten gäller en prissättning som Valio gjorde under 2010-2012, skriver ATL. Arla och Valio har nu gjort upp i en förlikning, vars innehåll är hemligt.